This is the fourth blog post as part of our Dibblers’ Diaries blog, which offers first-person stories from our interns. Summer Rich is a coastal policy and restoration intern. In the last couple of weeks, my work at the North Carolina Coastal Federation this summer has started to come full circle. 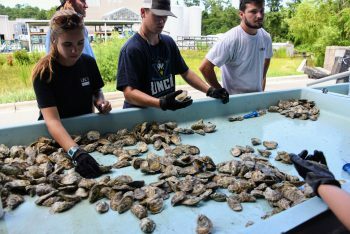 I’ve spent most of this internship researching the potential and logistics of a North Carolina Oyster Trail, which is part of a much larger shellfish mariculture plan for North Carolina. A working group has been meeting regularly to create a report to submit to the North Carolina General Assembly. Marygrace, another intern, has been working with other staff members to create an appendix of mariculture plans in other states that will be submitted as background information to the General Assembly as part of this report. In order to keep up with the growing oyster mariculture industry in North Carolina, I have been helping the federation develop the North Carolina Oyster Trail to brand and market North Carolina oysters. This project has primarily consisted of compiling a list of potential trail sites with GPS coordinates, so that the sites can be mapped at a later date. In many ways this project has allowed me to get to know the other coastal counties from a desk at the federation’s headquarters office in Ocean. 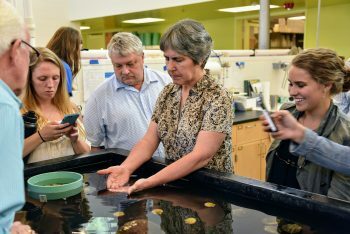 However, things really started to come together when we attended a mariculture meeting in Wilmington hosted by the working group I mentioned above. Marygrace had a chance to see components of the mariculture plans and policies come to life, such as a floating upweller system, commonly called FLUPSY. We have both attended meetings during which several people have called in, and this meeting finally connected names to faces. It was also interesting to see several of the major players, important to the grand scheme of the mariculture plan, in one room working together. Having grown up in Carteret County, life in general started to come full circle, as I’ve encountered people I grew up with during my work with the federation. This most recently happened when I stepped up to present my North Carolina Oyster Trail research. Looking around the room, I realized a member of the working group was my soccer coach of 10 years, whose daughter I grew up with. Hearing him speak at this meeting brought me back to middle school, where he came to class to give a speech for “Bring Your Parents to Work Day.” I remember him explaining the work he did, and it all just went right over my head. Yet here I was representing the federation as an intern, listening to him give a similar speech. While I lack the environmental science education many of my fellow interns have, I am finally at a place where I understand the basics of what the federation does. This new understanding of our coastal ecosystems is all thanks to opportunities this internship has provided. This knowledge has come through conversations with my fellow interns and staff members; public meetings, such as the ones hosted by the Coastal Resources Commission and the mariculture working group; field days; workshops; and my individual research. Similarly, my dad has been covering environmental issues in the area for numerous newspapers, without an environmental background. It never occurred to me that this internship would line up to so closely to the work my dad has been doing for decades, but that’s a topic that deserves its own blog post, or two.